By Mark O. Liner, P.E. Photo: The wetland system at the Anoka County landfill exploits natural processes to remove metals from the leachate. Wetlands are complex reactors that facilitate numerous chemical and biological reactions, and these reactions can be exploited to remove pollutants. 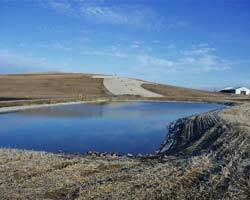 Today, engineers are able to design wetland systems that can clean up landfill leachate onsite. Landfill leachate has a complex and ever-changing composition, but advances in natural treatment systems and the innovative use of traditional wastewater equipment have proven their value against this challenge. In addition, onsite treatment can lead to onsite disposal, which eliminates the need to capture and haul leachate. Research is the basis for a long-term management solution For leachate treatment, researchers have investigated the bacterial pathways responsible for ammonia removal and evaluated the use of wetlands and other methods. Mulamoottil et al. published Constructed Wetlands for the Treatment of Landfill Leachate in 1998, which provides a compilation of work done on the subject (Lewis Publishers, 1999). Work focusing on newly understood reactions, like autotrophic nitrogen removal (CANON) and heterotrophic nitrification, are further laying groundwork for employing attached growth bacteria commonly found in subsurface wetlands for landfill leachate treatment. Jones County, Iowa Considerable wetland leachate pilot work has been done at landfills. In Jones County, Iowa, a horizontal, subsurface-flow wetland that was fitted with a patented Forced Bed Aeration™ system and mulch insulation demonstrated consistent cold weather nitrification of leachate over the period of August 2003 to April 2005. The mulch layer modulated the effects of the Iowa winter and reduced heat loss from the leachate, while the aeration system provided the oxygen necessary for ammonia oxidation. The aeration system provides a simple means to uniformly aerate the floor of the wetland. This ensures that the entire wetland bed remains aerobic. The design uses a regenerative blower and a matrix of half-inch aeration tubing. An electrical blower adds a mechanical component to an otherwise natural process, but provides a degree of control and reliability not usually experienced in purely natural systems. The system was designed by Jacque Whitford NAWE. Pilot work over the past 10 years, including studies in Florida, Ontario, and Delaware, has demonstrated the advantage of using of vertical, subsurface-flow wetlands and multi-cell configurations with aerobic, anoxic, and anaerobic zones. To control system performance, operators could adjust operation of the recirculation pumps in the vertical flow wetlands. For the Anoka County Landfill in Minnesota, engineers designed a full-scale bioremediation system for 288,000 gallons per day of leachate-contaminated groundwater. The design included eight 50,000-square-foot horizontal subsurface-flow wetland treatment cells. For year-round treatment, the wetlands were insulated using energy balance design methods. Forced bed aeration is used within the wetland cells to create alternating aerobic/anaerobic zones for degradation of complex organic compounds, including tetrahydrofuran. Research on wetland performance in full-scale systems includes a landfill in New Hanover County, N.C. Important to the design was incorporating some of the findings discovered during pilot testing. For instance, the targeted use of “distribution trenches” within the wetland minimized short circuiting. "Since installation in April of 2002, the level of treatment provided by the wetland system has exceeded all our expectations," says Sam Hawes, an environmental specialist for New Hanover County. "Our constructed wetlands treatment system receives raw leachate with an average total nitrogen concentration of 150.0 mg/L and reduces that by 90 to 95 percent." Based on pilot work, the landfill in Kent County, Del., has recently started full-scale construction of a vertical flow wetland system. The onsite treatment of leachate will enable irrigation of the treated effluent to the landfill’s innovative phytocap system. The phytocap system is a planted-soil capping technology that provides a natural means for covering closed landfills and reduces the introduction of water into the leachate. Pre-treatment of the leachate by the wetlands aids in maintaining the survival and growth of plants used in the phytocap system. In Portland, Maine, a full-scale, five-cell wetland system has successfully treated underdrain water and leachate from a landfill site since 1999. Subsurface-flow wetland designs provide excellent treatment performance for oxygen-dependent processes such as nitrification (for example, ammonia removal). The water is kept below the surface and flows through a gravel bed full of microbes that are hungry for specific pollutants. At one project in Illinois that is a good example of this technology in action, no more waste can be dumped, however, this landfill will continue to generate landfill leachate for decades to come. To substantiate the final design, a study was recently conducted that included a pilot system containing aerated pretreatment and a settling chamber and two subsurface-flow engineered wetland cells. The study was completed this spring. The pretreatment and settling chamber oxidize and settle out iron from the leachate before the leachate is sent to the wetland cells. If this is not done, iron-eating bacteria can clog the wetland’s gravel bed and decrease treatment performance. Similar to other systems mentioned previously, the treatment wetland cells are equipped with a Forced Bed Aeration™ design that provides oxygen for ammonia removal, even during sub-zero temperatures. Other semi-passive approaches for wetland aeration, like tidal flow, also are used for ammonia removal but these typically cannot be applied in cold climates due to ice formation. Results from the first six weeks of the pilot study are promising: influent ammonia concentrations upwards of 250 mg/L are treated consistently to less than 1 mg/L. Ammonia removal averages 99.8 percent (Table 1). Data generated by the pilot study will be used to size the final treatment system, which will treat 6,000 gallons per day. Applying the findings from recent research and pilot studies, designers are using well understood engineering practices to greatly improve the performance and reliability of onsite treatment systems. The advances in wetland treatment are helping landfills dispose of leachate onsite, which is a welcome alternative to trucking leachate and disposing it offsite. Controlling nitrogen is key to onsite irrigation, and engineers are showing that use of aerobic zones in wetlands by recirculation or forced air is an effective means to remove ammonia. The use of subsurface wetlands also is showing promise, particularly with respect to introducing elements of operator control, limiting the impact of foul weather, and promoting the growth of resident bacteria. With such new-found potential, nature’s wetlands are proving to be a valuable asset in managing man’s landfills.